Backed by state-of-the art manufacturing facilities, we have been able to develop our product range in Solar Motion Sensor Security Lights. Our entire product range is tested stringently to ensure that the quality of our products is maintained at every level of production, packaging and final delivery. This is designed to keep your home, unmanned areas under surveillance safe and secure. As any object comes within the above range, the Light comes on & remains on till the object is in the range. 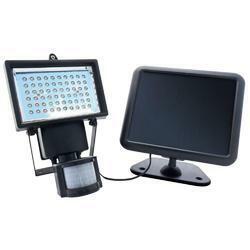 We offer Solar Motion Security Floodlight. The Sensor can be set at 4 to 30 seconds,so that after the set time, once the object is out of the range the light goes off. PIR Motion Sensor Detector senses motion within 15M & upto 120 degrees. 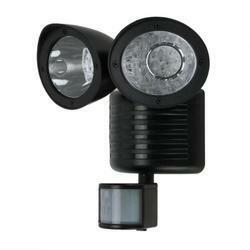 We offer Solar Motion Security Light (Twin Head). Bright and reliable light; designed to keep your home safe and secure. It is accompanied by a PIR Motion Sensor Detector senses motion within 15M & upto 120 degrees. As any object comes within the above range, the Light comes on& remains on till the object is in the range. The Sensor can be set at 4 to 30 seconds, so that after the set time, once object is out of the range the light goes off. Designed to keep your home safe and secure, As any object comes within the above range, the Light comes on& remains on till the object is in the range. We have due to our focus on quality of products, customization, process and service levels, working with various well known companies belonging to industries like engineering, automotive and others.